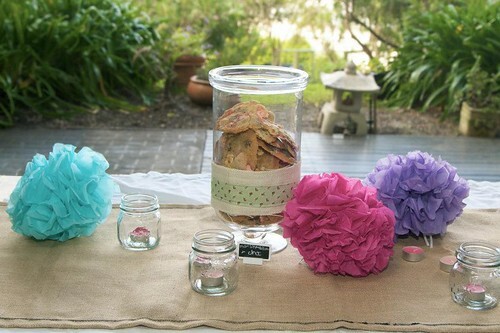 On Sunday afternoon we had my best friend’s bridal shower which meant a weekend of madly running around trying to organise everything in the 36 hours before the party. 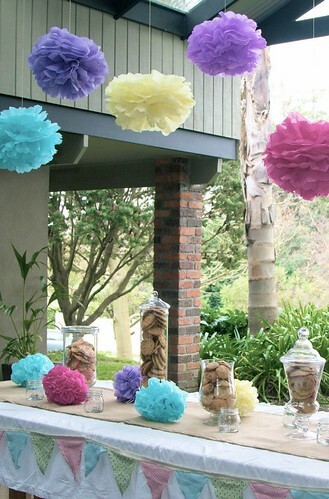 I was helping to organise a few things but my main responsibility was putting together a cookie bar. The cookie bar turned out to be a bit of work, it involved making a table runner, making a bunting, making martha stewart style tissue paper pompoms, buying candles, finding small jars to put the candles in, finding big apothecary-style jars for cookies, making ribbony things to wrap around the cookie jars and finally baking about 200 cookies. I spent 2 late nights after work making different cookie doughs and then baked them in batches over about 12 hours on Saturday (along with 50 red velvet cupcakes). I decided to make 4 different types – a 48 hour choc chip, a white choc macadamia, anzacs and some cornflake-chocolate-chip-marshmallow cookies I found a recipe for in the Momofuku Milk Bar cookbook that Gerard gave me a while ago (available here). Like a lot of Momofuku milk bar products it sounds a bit crazy but is absolutely addictive. The cookies spread a lot more than I expected them to, and so ended up being very thin, but were still dangerously tasty. 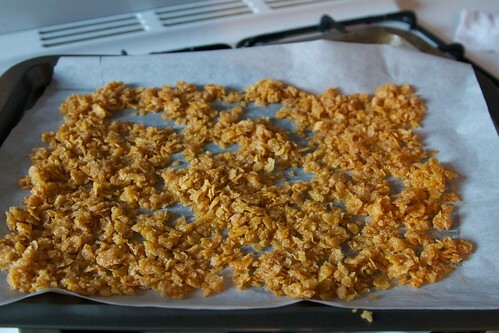 Put cornflakes in a bowl and crush with your hands. Add milk powder, sugar, salt and mix. 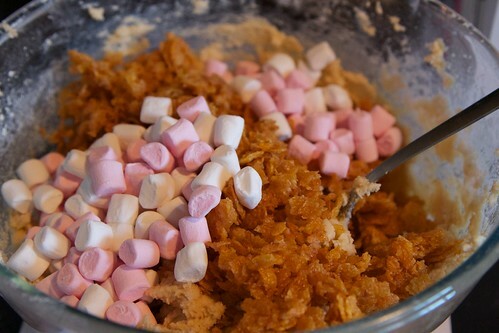 Melt the butter and mix through the cornflakes. Add the egg and vanilla, mix for another 7 minutes. Add the flour, baking powder, baking soda and salt and mix. 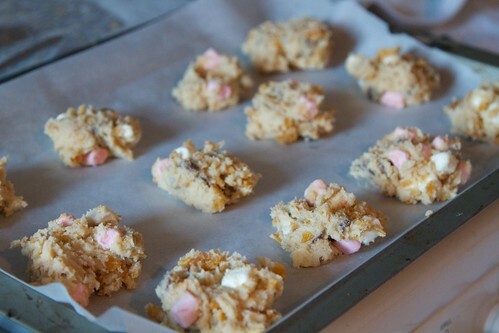 Mix in the cornflake crunch, chocolate chips and mini marshmallows. Refrigerate the dough for at least an hour (either in large tablespoon sized balls on a tray or in a sausage shaped roll wrapped in gladwrap which can then be cut into slices to bake). Bake for 18 minutes or until a little browned. Make sure you leave lots of space around them because in my experience the cookies spread a lot, I ended up baking 6 per tray. Let the cookies cool and then enjoy! I know people always tell you to wait until biscuits have cooled down before you eat them even though they’re normally far more delicious hot, but in this case I think the advice is for a good reason, they really won’t hold together when they’re hot. 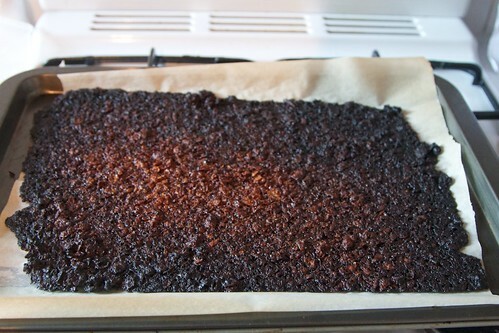 And just for fun, here’s a shot of my partially assembled cookie bar, I think it worked out pretty well.